The Supreme Keto Holidays Bundle! 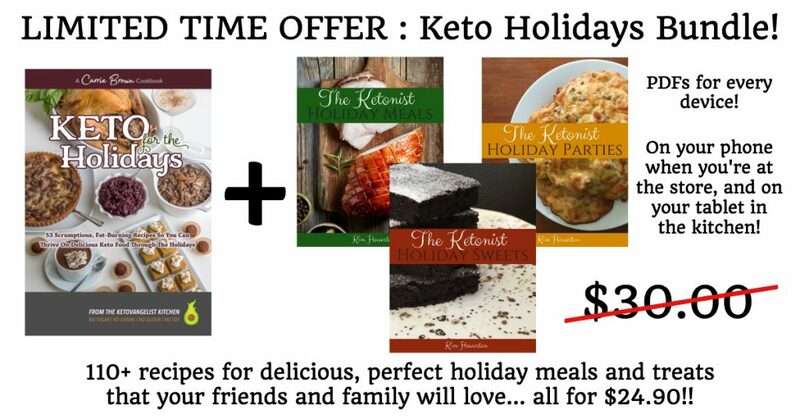 Carrie Brown’s KETO for The Holidays + Kim Howerton’s Holiday Meals, Parties, and Sweets at a Limited Time Offer Price! Approaching your first KETO holiday season and wondering how on earth you will stay in ketosis without giving up all your favorite holiday foods? Don’t have hours to spend searching Pinterest and Google for recipes that aren’t actually KETO, don’t work and / or taste nasty? Don’t want to waste time and money making recipes that you end up throwing away? Want to prove to your friends and family how amazing KETO is for their bodies AND their taste buds? Want to eat food that tastes better than the food you ate before you went KETO? Check out the KETO Cookbooks included in this Special Offer at the bottom of this page. Get your DIGITAL download of these amazing KETO Cookbooks right now and get ready to enjoy the best tasting, healthiest holidays you’ve ever had! PLEASE NOTE: THESE ARE DIGITAL COOKBOOKS THAT YOU DOWNLOAD TO YOUR DEVICE, AND ARE THEREFORE NOT RETURNABLE OR REFUNDABLE. Just hit the images below to get full details on the scrumptiousness contained within!